Once out to sea the elephant seals are usually solitary and spend the majority of their time feeding on fish, cephalopods (squid and octopus) and crustaceans (shrimp and crab). 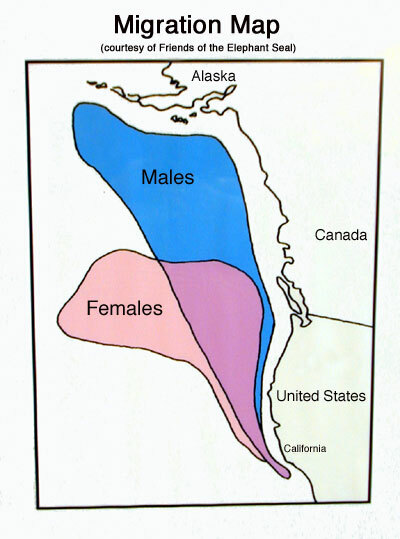 The northern elephant seal males range across the Pacific Ocean almost half way to Japan. They tend to stay more northerly than the females (about at the latitude of Canada). The female northern elephant seals range out to sea off the west coast of the USA but only out as far as the center of Alaska. Little is known of the foraging ranges for the southern elephant seal. One of the records for the deepest dive of a marine mammal is held by the elephant seal. While at sea it is believed that the northern elephant seals dive again and again to depths of a few thousand feet. Each dive may be for about a half hour or more. They only spend a few minutes at the surface between dives. The record for the deepest dive belongs to an elephant seal (2002) that was recorded to a depth of 5,141 feet. Elephant seals have numerous adaptations for deep diving including having more hemoglobin in their blood (to store oxygen), more myoglobin in their muscles (to store oxygen), the ability to slow their heart and peripheral blood circulation (to conserve oxygen) as well as having a large sac just outside their heart that stores oxygenated blood. 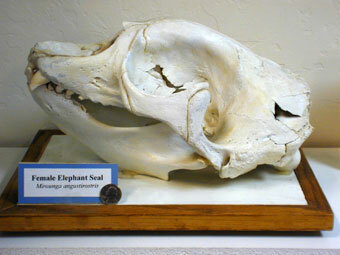 The elephant seal and the sperm whale have both held the record for the deepest marine mammal dive in the past. Recent records may show that the sperm whale (another deep diver) may reach depths over 6,000 feet (but this is unconfirmed). 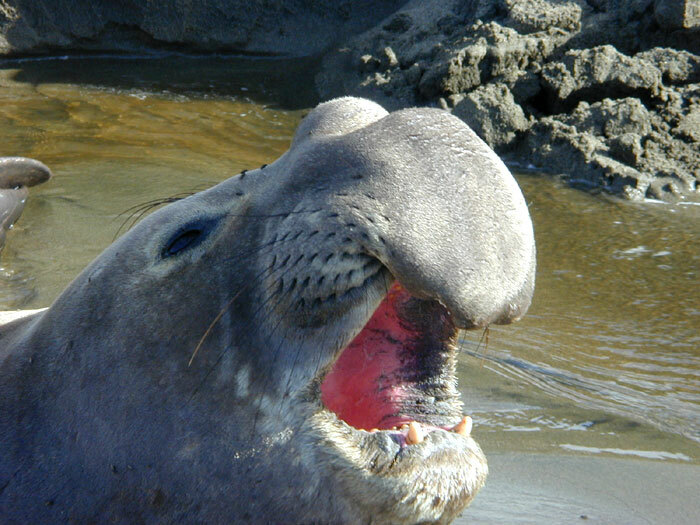 Elephant seals must consume a great deal of food while at sea to offset the time they are fasting on land (both during their molting and reproduction). Little is known about the elephant seals while they are at sea because they are spread out and spend most of their time underwater. They are very hard to study during the foraging period of their life. It is thought that most individuals may spend as long as eight to ten months at sea feeding. 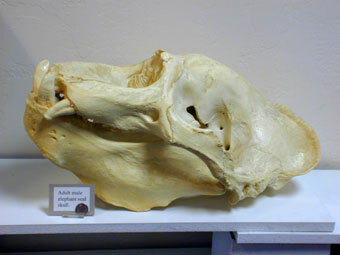 The canine teeth of the elephant seal are the most prominent. Although both the upper and lower jaws have eight pairs of teeth, all but the canines are flat and peg-like. These teeth are used to hold the prey and then it is swallowed. Most prey items are of a size that can be swallowed whole, or the prey is thrashed around until it is broken into pieces small enough to be swallowed.